Cutaneous metastasis is not an uncommon manifestation of visceral malignancy. In most cases, it develops after initial diagnosis of primary internal malignancy and late in course of disease. In extremely rare cases it can be presenting sign of underlying primary malignancy. Melanoma is the most common primary malignancy followed by breast, nasal sinuses, larynx oral cavity, and thyroid. Since breast carcinoma is common, cutaneous metastasis of breast carcinoma is most frequently encountered in clinical practice. Various morphologic variants of it has been described. Most common is solitary to multiple nodules, followed by rare variants such as carcinoma erysipeloides, carcinoma en cuirasse, carcinoma telangiectaticum, alopecianeoplastica, metastasis to the inflammatory crease, and zosteriform pattern. , Less than 30 cases of zosteriform cutaneous metastasis due to internal malignancies have been described in the English literature. We report a case of a 60-year-old woman presenting with zosteriform cutaneous metastasis as a primary manifestation of carcinoma breast, which was diagnosed on FNAC. 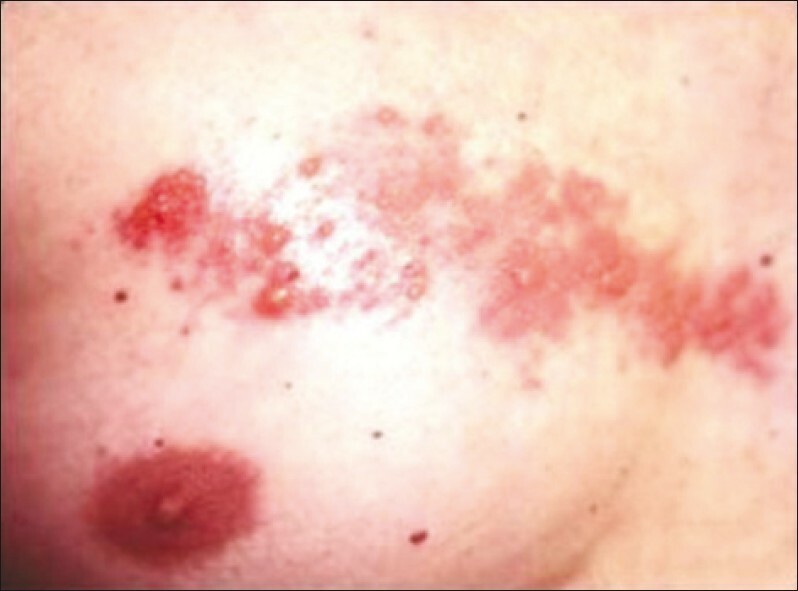 A 60-year-old woman came with painful papulovesicular lesions on right chest ranging from 02 to 05 mm in diameter [Figure 1]. Patient gave no history of itching at the site of lesions. Lesions were located in linear fashion along T2-T3 dermatome. A clinical diagnosis of herpes zoster was made and treated with acyclovir to which patient did not respond. After 2 weeks, patient again came with history of persistent lesions. Clinical diagnosis of cutaneous metastasis was revised. FNAC was advised for definitive diagnosis. 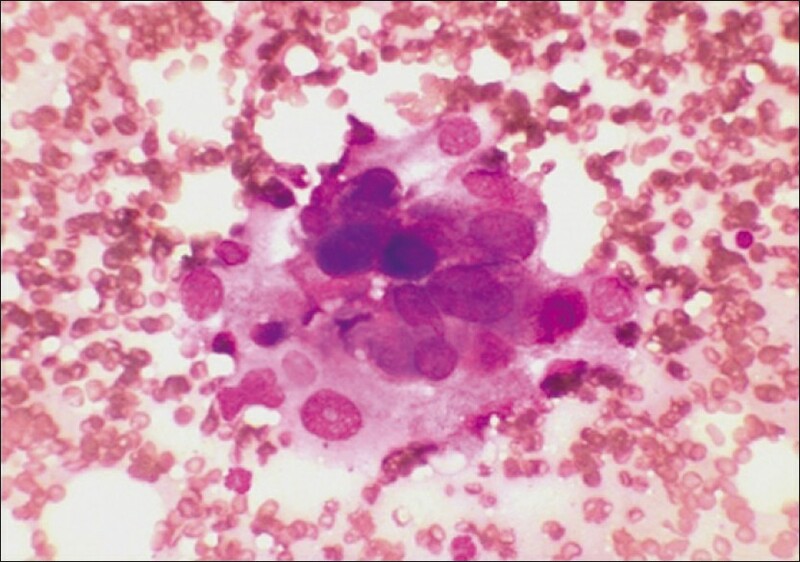 Smears showed few small loose clusters of highly pleomorphic cells with large nuclei and prominent nucleoli [Figure 2]. Diagnosis of cutaneous metastasis was made. 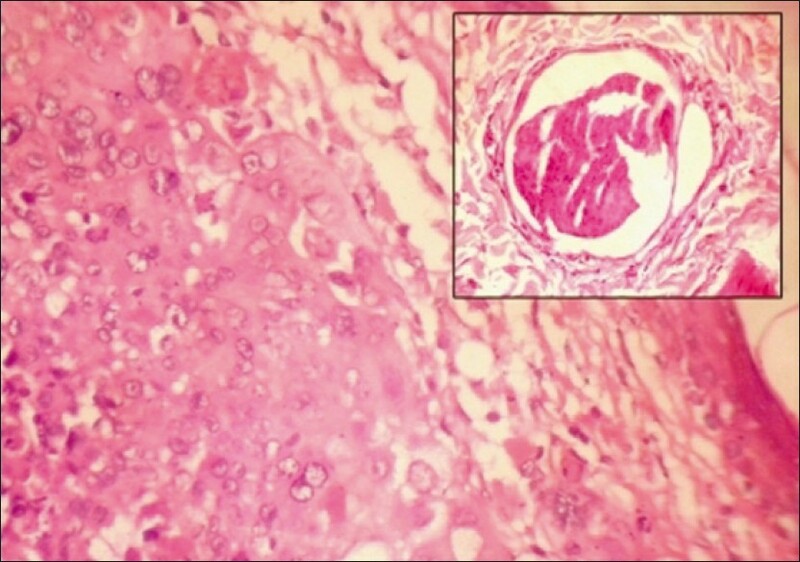 Biopsy of lesion showed well-defined nests and sheets of pleomorphic cells in dermis with hyperchromatic nuclei and prominent nucleoli and tumor emboli in dermal lymphatics [Figure 3]. Primary breast carcinoma was suspected. Further investigations showed 1 × 1 cm in diameter deep seated, ill-defined heterogenous hypoechoeic lesion in outer upper quadrant of right breast on ultrasound examination. Other medical findings were noncontributory. Ultrasound-guided FNAC confirmed diagnosis of breast carcinoma. The clinical features of metastatic skin cancer vary enormously. Zosteriform pattern is very rare type of cutaneous metastasis with only few reported cases. Patients with spontaneous pain mimicking herpes zoster like lesions in zosteriform metastasis are often wrongly treated initially with antiviral drugs. Distribution of cutaneous metastasis is related to mode of spread and location of the primary tumor. Exact mechanism of zosteriform metastasis is still speculative. Four possible hypothesis are put forward: 1) Kobner-like reaction at site of prior herpes zoster; 2) neurolymphatic spread via fenestrated vessels of dorsal root ganglion; 3) accidental surgical implantation; 4) perineural lymphatic spread which is likely to be the cause in our patient. Usually, it is on the same side as that of primary carcinoma, which can pinpoint location of primary and early diagnosis which happened in our case. Rarely, it can be on the opposite side or at a distant site. Prognosis of the patient with cutaneous metastasis depends on the type, biologic behavior of the underlying primary tumor, and its response to treatment. In our case since cutaneous metastasis was the only manifestation, early diagnosis of primary carcinoma improved the prognosis. Patient was treated with modified radical mastectomy. Postoperatively, she received systemic chemotherapy and is on close follow-up. So we conclude that in nonhealing herpes zoster like skin lesions, FNAC should be the first line of diagnostic modality for early diagnosis of primary carcinoma. 1. Santosjuanes J, Lopezescobar M, Palicio HV, Rlvas BM, Galache C, Sancehz del Rio, et al. Zosteriform cutaneous metastasis from a breast carcinoma. Med Cutan Iber Lat Am 2007;35:89-93. 2. Rao R, Balchandran C, Rao L. Zosteriform cutaneous metastasis: A case report and brief review of literature. Indian J Dermatol Venerol Leprol 2010;76:447-52. 3. Agarwal S, Rao S, Arya A, Gupta K, Arora R, Dhawan I. Follicular thyroid carcinoma with metastasis to skin diagnosed by fine needle aspiration cytology. Indian J Pathol Microbiol 2008;51:430-1. 4. Mahore SD, Bothale KA, Patrikar AD, Joshi AM. Carcinoma en cuirasse: A rare presentation of breast cancer. Indian J Pathol Microbiol 2010;53:351-8. 5. Kikuchi Y, Matsuyam A, Nomurak. Zosteriform metastatic skin cancer: Report of three cases and review of literature. Dermatology 2001;202:336-8.